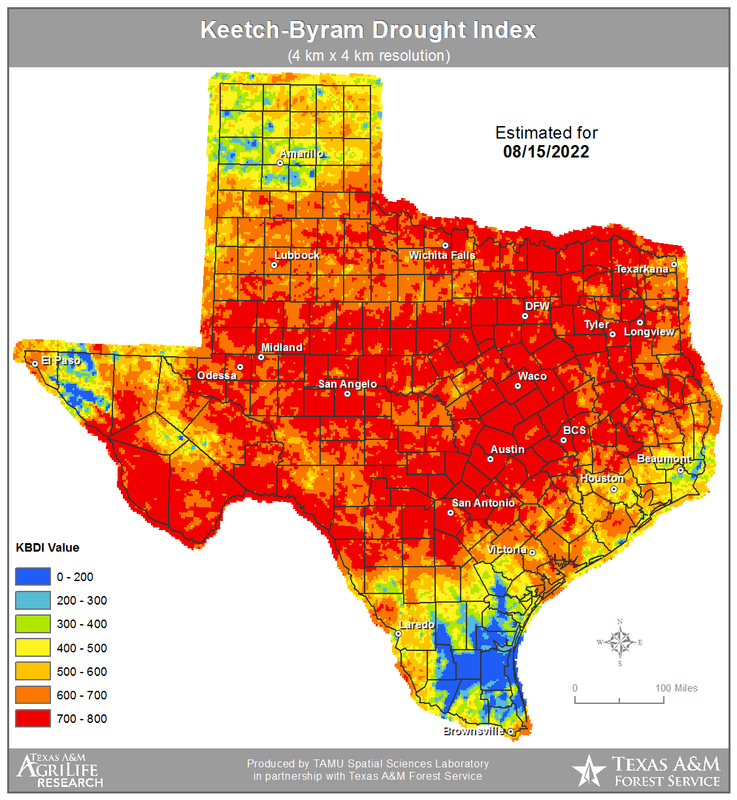 The Keetch-Byram Drought Index is an index used to determine forest fire potential. The index is based on a daily water balance, where a drought factor is balanced with precipitation and soil moisture (assumed to have a maximum storage capacity of 8 inches) and is expressed in hundredths of an inch of soil moisture depletion. The KBDI attempts to measure the amount of precipitation needed to bring the top eight inches of soil back to saturation. Zero represents complete soil saturation or no moisture deficiency. 800 means it would take 8 inches of precipitation to fully saturate the soil. 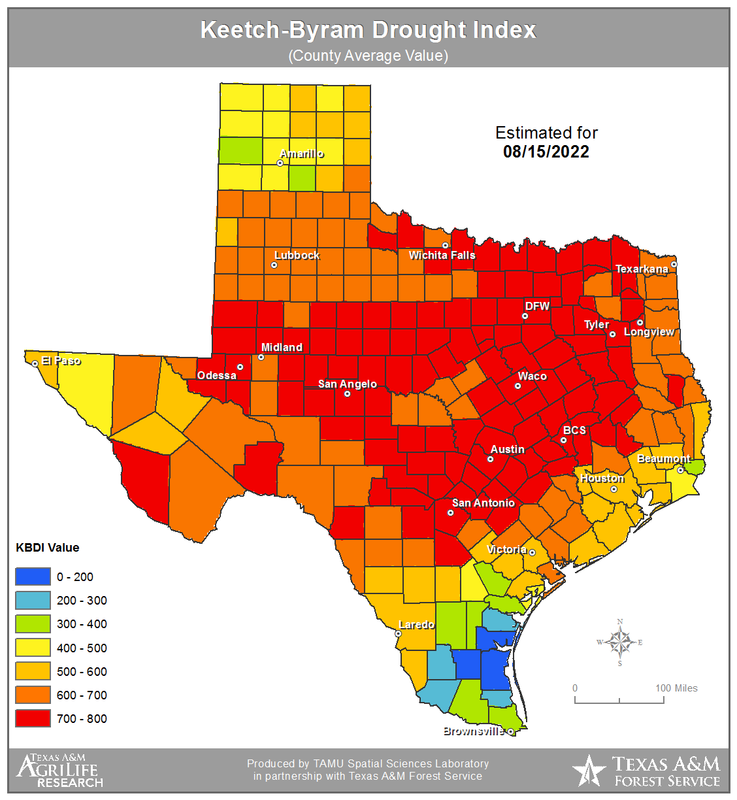 800 is the maximum drought that is possible. High KBDI values indicate that conditions are favorable for the occurrence and spread of wildfires. The following table shows how KBDI and expected fire potential relate. 0 – 200 Soil and fuel moisture is high. Most fuels will not contribute much to wildfire intensity. This is often seen in spring after winter precipitation. 200 - 400 Fuels are beginning to dry and contribute to wildfire intensity. Heavier fuels will still not readily ignite and burn. This is often seen in late spring. 400 - 600 Wildfire intensity begins to increase significantly. Wildfires will readily burn and larger fuels could burn or smolder for several days. This is often seen in late summer and early fall. 600 - 800 Wildfires will show extreme intensity. Deep-burning, intense wildfires with significant spotting can be expected. This is often associated with severe drought. Presently, this index is derived from ground-based estimates of temperature and NEXRAD radar of precipitation derived from weather stations and interpolated manually by experts at Texas A&M Forest Service for counties across the state. Researchers at Texas A&M University are working with TFS to derive this index from NOAA National Weather Service data and NEXRAD radar rainfall within a GIS.